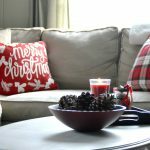 I love these mornings when I get up before anyone, turn on the Christmas tree, light some candles, and have a cup of coffee. And…actually drink it when it’s still warm. Yes, I love snowy Saturdays. When you have two teens, life can be busy. Actually, it can be downright hectic…especially at this time of year. Life got a bit easier when my oldest began to drive, but between sports, chorus rehearsals, and a variety of activities, much of my time is still spent in the car. I can rack up the miles without even leaving my town. These mornings, when all activities are cancelled, and everyone is sleeping is HEAVEN. Don’t get me wrong, these two, along with my sweet husband, are my life and my everything, but a little time to myself, at home, is welcomed. In our everyday life, we don’t eat in the dining room very often, but I did set the table for today. I am determined to have a big breakfast and take the time to sit, talk, and linger a little longer. 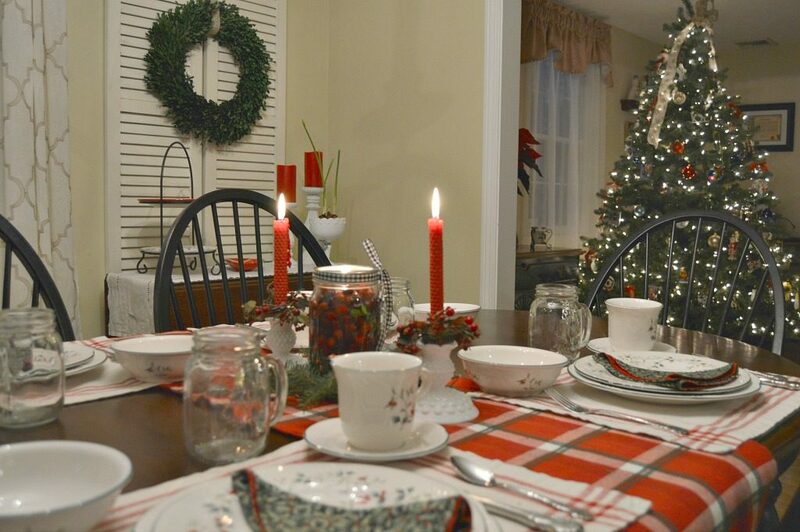 Come on in and visit our dining room, all decorated for Christmas. I kept our table pretty simple. The festive beeswax candles were a gift made by one of my fourth grade students a few years ago. What a talented girl! I love the color and texture. 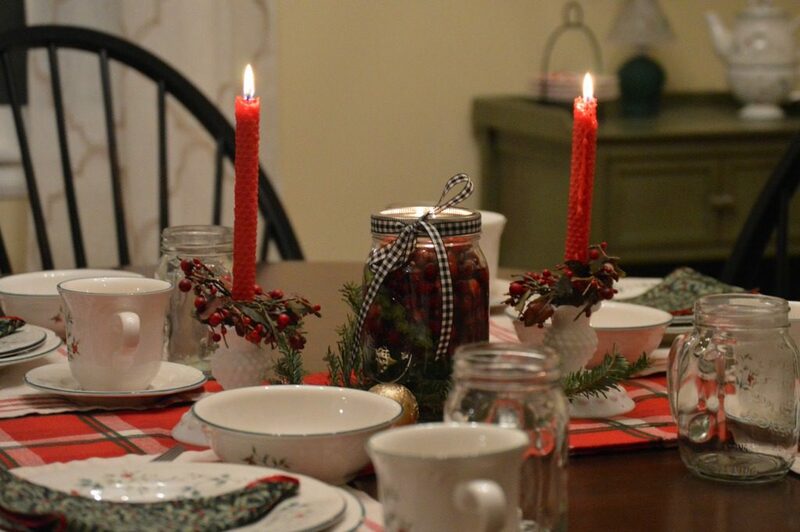 I made a simple mason jar centerpiece with a few boxwood clipping from my yard, water, cranberries, and a tea light candle. I added some greens that my husband got from the Boy Scout when he bought our wreath. 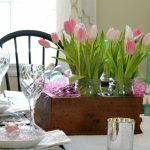 I tend to be cheap frugal and like to use what I have for decorating. 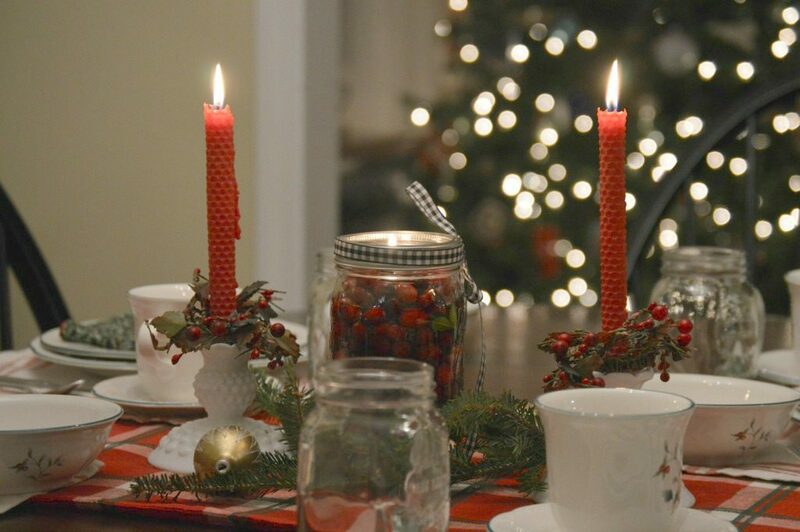 A few ornaments complete the table. When we got married, I didn’t want fancy china. I like things that can go in the dishwasher. Yes, I am a little lazy. I prefer to think that I am practical. 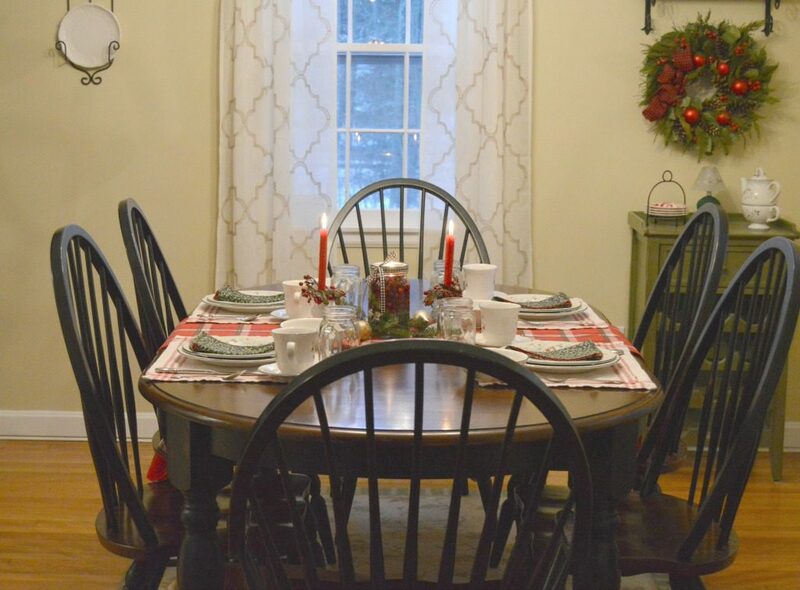 Here is a view of my DIY Repurposed Shutters, as well as some empty plates. Cookie baking is on the agenda for today. I am planning on making Andes Candies cookies…yum! What are your favorite kind of cookies to bake? This is also a good view of our tree. Our tree is jam packed with family ornaments and I love it. Each one brings back a memory of the life we are building here. I also wanted to share a sweet decoration/gift card holder that I won in an Instagram giveaway. 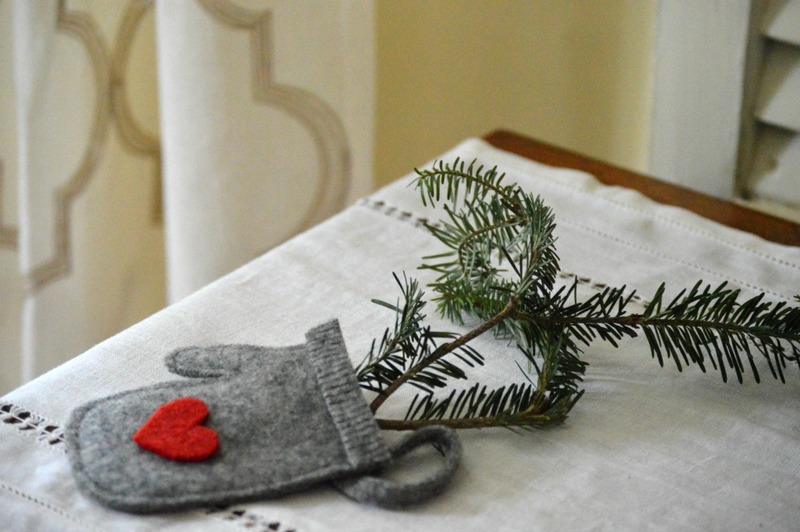 This little wool mitten was made by the very talented Nathalie from TrendyEarth Etsy Shop. 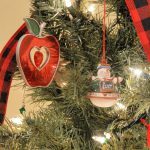 I recently found a fun new Christmas sign at Home Goods. With two teens, a sense of humor is essential and this sign is perfect! 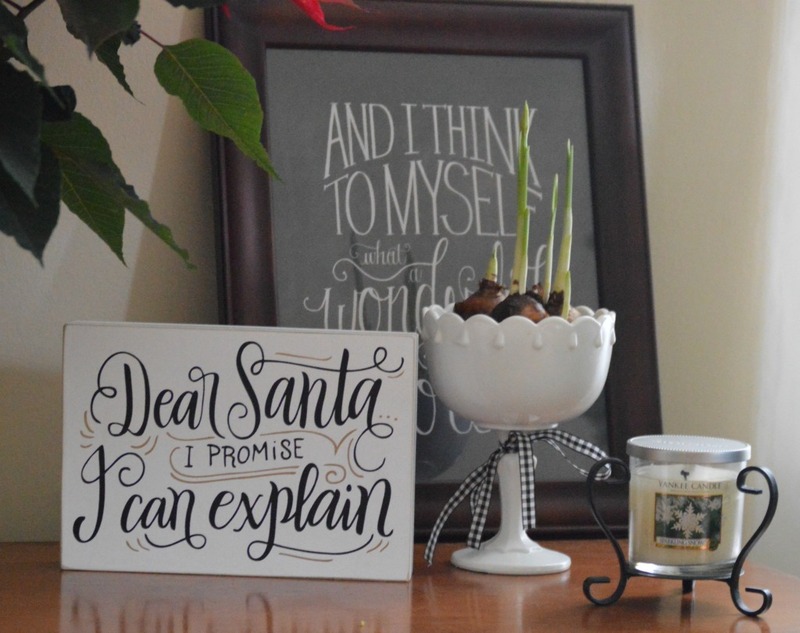 It sit well with a poinsettia, a sign from Dear Lillie, a Yankee Candle, and some sprouting paperwhites. The morning is now bright and the snow has blanketed our little piece of the world. I hear my people stirring upstairs, so I will leave you with our most treasured Christmas decoration. This is our Nativity. In the hustle and bustle of life, it is so important that we remember the true meaning of Christmas. I would love to keep in touch with you! Please consider subscribing to my email list. You may also want to follow me on Instagram, which is my favorite place to share! We can also pin together on Pinterest. Lynne your table is beautiful!! I love your Christmas dishes. Have a very Merry Christmas!! Thanks so much for your sweet comment, Susanne! Merry Christmas to you and your family! 🙂 LOVE your simple table and dishes that go right into the dishwasher! You have inspired me with the paper whites. MUST do that for next year. The repurposed shutters are awesome. You certainly could add a wreath for a different holiday season. The candles- wow! I love when kids give me home made gifts, too. Merry Christmas!!! Thank you, Melissa! Your kind words made my day! Best wishes for a very Merry Christmas! Thank you so much for your kind words, Marjan! 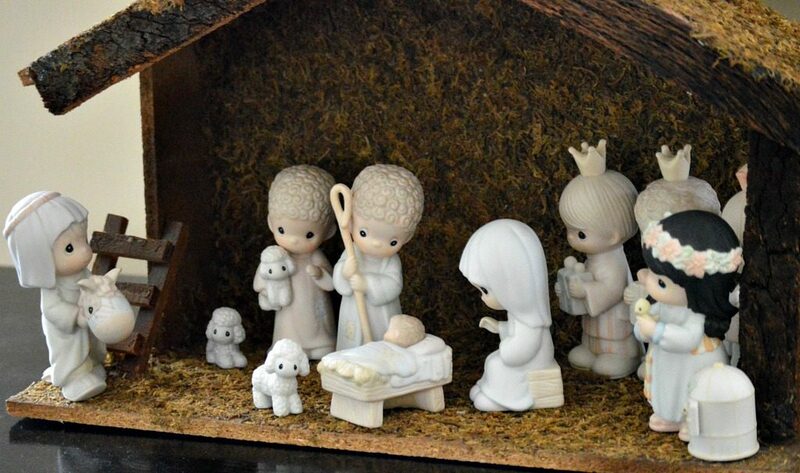 The nativity set was a gift from my husband for our first Christmas together. We have added to it through the years. I am a little late to this post, but it is so lovely! 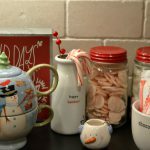 Your breakfast table is perfect – and all the Christmas decorations are simple, yet work together so cohesively! I love the ambience you created with both your words and pictures. I could almost smell the coffee!! Thank you so much for your comment, Kristine! I appreciate your kind words! Best wishes for a wonderful weekend!